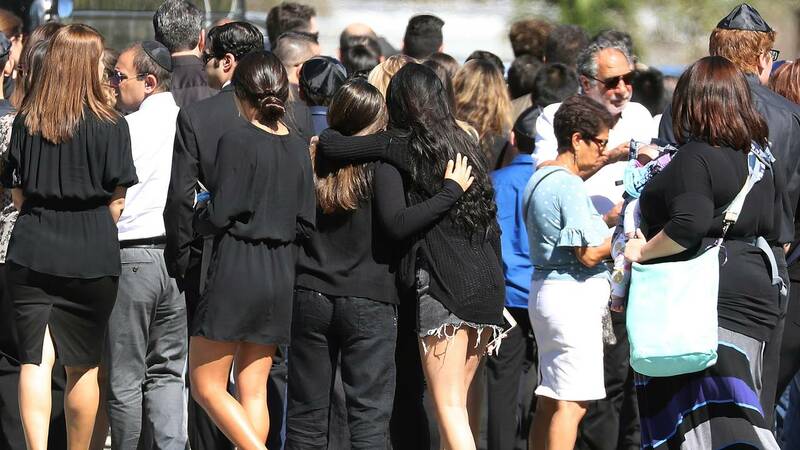 Mourners are seen at the funeral of Alyssa Alhadeff at the Garden of Aaron at Star of David Memorial Gardens on February 16, 2018 in Parkland, Florida. (CNN) - Russia-linked bots are promoting pro-gun messages on Twitter in an attempt to sow discord in the aftermath of the Florida school shooting, monitoring groups say. Hashtags, topics and URLs related to the shooting overwhelmingly feature in the tweets pushed by these automated Twitter accounts in the past 48 hours, according to Hamilton 68, a tool launched by the Alliance for Securing Democracy to track what it describes as "Russian propaganda and disinformation efforts online." The alliance is a group housed at The German Marshall Fund of the United States (GMF) think tank to "defend against, deter, and raise the costs on Russian and other actors' efforts to undermine democracy and democratic institutions," according to its mission statement. The group does not disclose which accounts it tracks and CNN has not independently verified its findings. Among the hashtags and topics related to the shooting are #falseflag, #fbi, #gunreformnow, #fbigate, #parklandschoolshooting, the name of the shooter -- Nikolas Cruz -- and Florida. Another bot-tracking website, Botcheck.me, reports that all but one of the top two-word phrases used in the past 24 hours by 1,500 political propaganda bots were connected to the shooting: "gun control," "Nikolas Cruz," "school shooting," "school shooter" and "fake news." The exception was "President Trump." Hashtags calling for gun reform and gun control are also topping the list. Unlike Hamilton 68, which targets bots related to the Russian government, Botcheck.me tracks accounts that generally spread political propaganda. Cybersecurity and media experts are not surprised that trolls and bots are leveraging the Florida school shooting to cause divisions. "This pattern of divisive propaganda is becoming a staple in information warfare fueled by social media, but it isn't exactly new," Marco T. Bastos, researcher at City, University of London and co-author of a paper on a network of pro-Brexit bots, told CNN. "Similar campaigns can be traced to at least 2014." In 2014-15, a large number of accounts controlled by Russian quasi-state units were mostly focusing on reinforcing domestic opinions, according to Christo Grozev, senior researcher at New Bulgarian University's Risk Management Lab and an author at investigations website Bellingcat. Grozev has been tracking approximately 400 Twitter "troll" accounts that were disclosed as part of a Russian leak in 2014. The "identities" of the accounts have changed over time. Currently they contain a mix of French and Spanish/Catalan identities, suggesting they had been repurposed as needed, Grozev said. The reason why these accounts seize on shootings like the Parkland school one is not ideological, but to amplify "extreme and divisive causes" in a bid to create "a distracted and weakened US government," Grozev said. "Gun control is simply one of those causes," he said. "It is not in any way an ideological preference for Russia to have less gun control in the US. It is, however, the perfect divisive cause." If the intent is not ideological, but to sow discord in American society, that could help explain why Russian-related bots are spreading hashtags calling for gun control laws and reforms. "Such hashtags serve mostly as bait: they serve to attract 'opposing view' readers, which results in explosive and discordant online mutual shouting -- in place of any reasonable debate, which would not be in the interest of Russia," Grozev said.